As promised today I ventured to Norwich to sample the new Wright Streetdecks on the Pink Line, which entered service last week. I decided not to copy everyone else by camping in Norwich taking pictures but to travel to Wroxham in the heart of the Broads to picture them there. This time last year I was in Brighton to sample the Streetdecks down there and my conclusions were rather inconclusive, so I was hoping to form a more clear cut assessment today. My first Streedeck was 35196, and first impressions weren't great when I got thrown down the bus by it surging away from the stop. However I got upstairs and settled down. First things first the seats are comfortable, the ride is smooth enough and the engine quiet. The WiFi wasn't working, which seemed to surprise First so there must be some gremlins in the system. I have to say the view from my usual seat at the front nearside upstairs is restricted by those unnecessarily large pillars. Thinking back to the RM I went on Saturday and the superb views out the same seat this is definitely a black mark against the Streetdeck. The plastic, like the E400's has a very, very cheap feel about it too and doesn't do much to promote any quality in the build. Looking straight ahead from the front top deack. Just like the Streetlites I take issue with the brakes. They sound like a 1980 Metrobus and are just as rough as the retarder on the Metrobuses used to be. The driver needs to have a very delicate foot - not something most bus drivers are blessed with! I was also underwhelmed by the apparent top speed on the lovely stretch between Sprowston and Wroxham. Seemed at least 10mph too slow and it was noticeable that nothing arrived into Wroxham on time. However Wroxham is a picturesque place, even if it was very nippy there today. That was enough to convince me to wait a further 20 mins and I was rewarded with 35195 for my return journey to Norwich. So my verdict? Is it anymore conclusive than last year? Unfortunately no. There is nothing about the Streetdeck that fills me with excitement or great enthusiasm. There is equally nothing hideously wrong with them either. Yes the brakes are sharp, the view from my favourite seat is poor, and the air chill situated at the rear of the top deck is hardly silent but none of those are enough to convince me to be ultra critical. I think they are definitely town buses not suitable for routes like the X1, which I thought last year but all in all they are ok. Nothing more nothing less. If the Streetdeck underwent a Litmus test it would score a perfect 7. So I decided to compare it with a Volvo B9tl Gemini 1. I went to Beccles and back on the X2 and I would still take a B9 over a Streetdeck with no hesitation. Will the Streetdecks be as good in 8 years time as the B9's are now? I seriously doubt it, and that really says it all. Did I feel I was traveling on £228,000 worth of bus? Erm don't think so. Last week I praised the improvements in Anglian's ex Metrobus Scanias. I had 555 today on my inward journey to Norwich and yet another surprise awaited me. I made a plea last week for the long standing air leak on the door lock mechanism to be fixed and blow me down it has been! No idea if it was the post which prompted the repair but frankly I don't care - it made the journey even better, so for the second week on the trot well done Anglian. Let's hope the tide is finally turning. There you go, Belinda Carlisle, I can narrow it down for you. Heaven, indeed is in Essex. If the number of the beast is 666, then the number of its opposite is 339. Let me explain. Yesterday Phileas Fogg and Passepartout, aka Steve and Tim ventured on an expedition to the rather confusingly name Epping & Ongar Railway. Now it is true the last time I travelled that line it was still part of the Central Line and indeed went from Epping to Ongar throught some really lovely countryside. Nowadays it should really be called the "100 yards from Epping & Ongar Railway" as trains no longer actually go to Epping station, but stop 100 yards from it, then go back without any opportunity to alight. So a top and tail train is needed. Yesterday providing the shuttle from North Weald in between the diesel loco hauled trains was former Southern Region thumper 205205, looking superb in NSE livery and sounding amazing. I travelled regularly on these little diesels and it's great to see one still in such great order. The main attractions on show were Class 31 31438 a visiting Class 20 D8059, A very impressive looking 37, D6729 and to sum up how monotonously slow the line is, a Class 08 shunter. I confess the 20 was the main reason for my attendance as those English Electric engines are just music to my ears. It didn't let me down although more opportunities for decent engine noise would have been appreciated. However the trains were overshadowed, eclipsed, hit for 6 by the other element of the day, which was completely unexpected. We knew that there was a heritage bus transfer from Shenfield Station to Ongar. What we were not aware of this is a registered bus service, numbered 339, which is available to anyone, not just users of the E&O Railway. The service runs everyday the railway does, so almost all weekends and all school holidays, including half terms. It offers local fares and accepts all bus passes including concessionary passes. A round trip from Shenfield to Epping will take over two hours so it's not just a short hop. And the fleet on this service? Well let's just say it's not E200's. At precisely 1050 at Shenfield Station this rolled up. No y friends, your eyes do not deceive you. 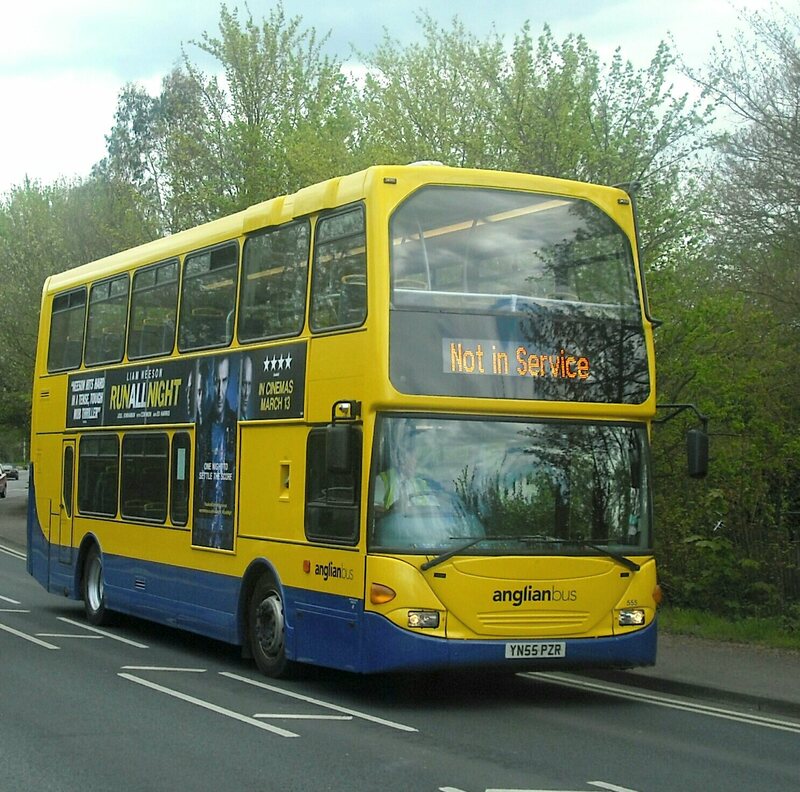 Let me introduce RT 3871, operating on a registered bus route in Essex. I think you can imagine the pleasing element of this. And so we boarded, not realising just how long the run to Ongar was. Now do you remember those old black and white movies featuring such vehicles that seemed to be speeded up, showing the buses racing around the streets? They weren't speeded up. That amazing old bus flew round the Essex countryside driven with incredible expertise by our driver. It was simply incredible, and guess what - no rattles! It really didn't matter what happened the rest of the day as nothing could spoil that experience. The London Bus Company, part of the heritage group running the E&O Railway operates a fleet of red and green RT's, and also a couple of RM's, including RM1993 which is the only one not pictured. We were going to catch the train back to Ongar to get the bus back to Shenfield, but realising we had covered all bases on the rails, a prolonged ride on an RM via Epping was too tempting to resist. The last RM I went on nearly made me cry - it had a Dart engine which in my view is deserving of a long stretch in prison. RM1066 though has an original RM engine and massaged my eardrums to a state of ecstasy. Like the RT it flew around the Essex streets, and even our lady clippie was straight out the golden age, taking no nonsense from a group of kids trying to cause trouble. In all honesty the railway was disappointing. The rolling stock seemed in relatively poor condition and it is a much better place to photograph rather than travel. But the buses, well! The fact it's a registered service that takes all tickets and passes makes it a must do again. I'd recommend it to anyone and if you don't get on and off grinning from ear to ear then I'm not sure what will make you! You can see details of the days and times of operation this year by clicking here and if you're wondering about DDA, well just like the trains because it's a registered heritage route DDA does not apply. Thanks, Tim for your company yesterday, and here's to the next outing! Not sure it will beat Heaven though! I think it would be nice to start with something positive, and there will be some of you in need of medical help when you see where this positive news comes from. In the last few weeks I have travelled on two Anglian deckers that in my view, and those driving them, have improved almost beyond recognition. When the 3 Scania Omnidekkas arrived from Metrobus last year although they looked great I was less than enthusiastic about most other things. They were extremely rattly, slow, unreliable to the point of it being laughable, and all in all not the greatest of additions to the fleet. Their whole set up was designed for town 28mph work and not Acle Straight/Poringland - Bungay type work. But now 555 and 556 feel like different buses. The most noticeable difference is the speed, which is much improved and they now show traditional Scania power. The ride is considerably better too, which suggests the suspension has been tackled, and even less rattles. A really pleasant surprise and since I'm going to be using the 88 again for a bit quite a relief. Just one thing guys - 555 arrived with a really annoying air leak on the door lock mechanism which produces a loud hiss the moment the bus does over 4mph. A year on and it's still there so please can you get it sorted! Cheers! The much improved 555 YN55 PZR seen somewhere last year! No idea where! Anyone know what the what the Chinese word "lingchi" originally meant? Apparently it described "the difficulty in travelling in a horse-drawn carriage on mountainous terrain." However the meaning soon changed and it became the word for the form of torture/execution known to us as the "death of a thousand cuts". Without going into too much graphic detail this involved flesh being removed a little bit at a time as it was considered unless the body was whole on death the spirit could never be free. How ironic that the term derived from the difficulties of using transport. It should be mentioned that Lingchi was made illegal in China in 1905. However it is alive and kicking in rural England as bus services are suffering the death of a thousand cuts. Council cuts to be precise, although instead of human blood being spilled it's the lifeblood of communities. This week it hit very close to home again. Today saw the last day of operation of the 196, the little village service between Saxmundham and Leiston, which also incorporates a single 521 journey between Saxmundham and Dunwich. I have often mentioned this bus, as it was my only regular link to the outside world that didn't involve pre-booking, albeit only one journey 4 days a week. It is no major surprise it has gone. In this age of shopping trolleys, buggies and easy access providing a 14 seater slide your own door open Transit minibus with no marketing or publicity whatsoever isn't going to achieve much. But it had its uses and I was indeed going to be using it to get to Leiston tomorrow. Now you wouldn't believe how difficult that journey's going to be. The thing is if I hadn't wanted to check the time it arrived in Leiston I would have been waiting at my local bus stop like a lemon for hours and missed my appointment. There is no roadside timetable at the stop, and unlike most changes to bus services it was not announced on the council website Suffolk On Board. I had heard rumours about the route's demise but no date. It was by sheer fortune I stumbled across a letter from SSC to Darsham Village Council while searching for the timetable that revealed today as the last date of service. After I made vociferous complaints to Suffolk On Board it was finally put up on the website - less than 48 hours before the route ceased to be. No changes for May have been announced yet, and I know there are some coming so get your act together please Suffolk On Board. People are increasingly relying on online information so make sure it's up there please. I also asked for information regarding the changes to Demand Responsive Transport serving my village - they said it was good news for me - but was only told to attend one of the launch events taking place in Woodbriidge less than a week before the changes are implemented. Firstly it would take hours to get to Woodbridge and back, especially as the DRT bus is getting increasingly difficult to book for that area, and secondly a week's notice when I know for a fact the minibus I use the most is no longer going to serve my village is not long to make other arrangements. It seems the news isn't good enough to let people know what's happening before its too late to protest. I have asked for maps of the new areas but no response yet. That's bad. Very bad. The cuts are beginning to fester and gangrene is setting in. Now unless you've been in a cave this week you'll have heard whispers of some new strawberry milkshake coloured thingamajigs (you wouldn't believe my obviously American spell check has flagged up "coloured" but not "thingamajigs") have arrived in Norwich. I attended the launch event yesterday in Norwich mixing with the great and the good of the blogging world and taking a look at the new buses. Now you know how I do these things by now - it only really matters what happens when the wheels start moving and so in due course I'll take a trip on some of the new Streetdecks and do a review. However I'm not setting the bar too high as someone from First told me yesterday he had been on one of them and it was already rattling. Sounds like I'll just be reproducing my post from Scotland last November which wasn't too complimentary about the Wright body. However I can tell you the seats are comfortable, there are no chargers or USB points, there's plenty of room for buggies to clog up the lower deck, the branding looks ok, and First could rent out the excess space in the engine bay which is enough for a fitter to lie down in comfort while tinkering with the Mercedes engine. They will certainly turn heads as they go pass. But I'm not going to post any pictures of them until I do my review next week as I have seen many comments from people saying they are sick of the sight of them already, so here s something far more spring like that I saw on the Isle of Harris last May - cuter than a Streetdeck too and mercifully not nearly as pink! But the event yesterday was good so a big hi to Roy, Zak, Dave, Simon, Cameron, Colin, Steve, John and Dan, but sadly no Chris, who for the first time in living memory missed an opportnity to get his face in the papers! £227,960 cheaper than a Streetdeck and a lot prettier! Probably less rattly too. 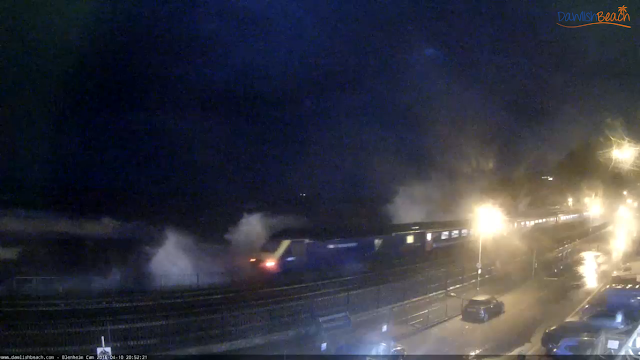 I appear to have started a new fad - railcam screen-shotting. After the post I published a couple of weeks ago sharing some of the stills I'd captured from the highly addictive Railcam.uk cameras it seems other armchair anoraks have caught the bug. Yesterday I was having a friendly exchange of pics with an esteemed photographer from another place and had the idea for a competition to see who can come up with the best rail related screen-shot. 1. The image MUST be a screen-shot taken by yourself from a live webcam which is clearly identified in the image, so credit and links can be given, and not reproduced from the website's gallery. The webcam may be anywhere in the world. 2. The webcam must be focused on a railway, but the image doesn't have to be of a train. It could be anything the cam has captured eg wildlife. 4. Extra points will be awarded for the uniqueness of the subject, eg rare loco or working, new paint job, dramatic weather etc. The editor's (me) decision is final. 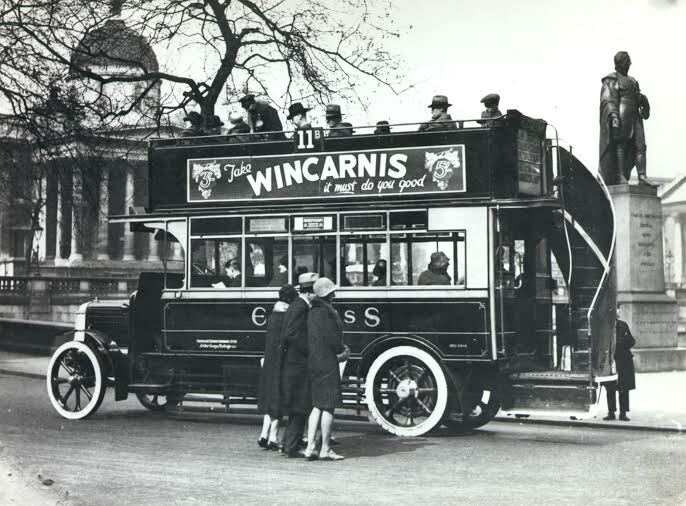 A couple of days ago I received an email from a fund raising fellow at London Transport Museum, asking me to publicise their latest venture, which is an ambitious project to preserve 3 buses dating from 1908, 1914 and 1924. I am more than happy to do so, and so publish the information below. The Leyland buses appeal is one of the most significant heritage acquisitions ever made by London Transport Museum. All three motorbuses represent important milestones in the Capital’s history that are not yet held in the London Transport Museum collection. London Transport Museum Friends have generously kick-started the appeal but your donation is crucial in helping us tell London’s transport story, giving people of all ages and backgrounds the chance to see and enjoy these buses as parts of the Museum’s publicly accessible collection. To donate please visit our website or phone 02075657451. To learn more about London Transport Museum Friends please click here. The picture below is of a 1924 LB5 Chocolate Express, from the Mike Sutcliffe Collection. You may remember that thanks to the sterling effort of many people the very last Volvo Olympian to be built, Yarmouth's 34110 was saved for preservation and moved to a new home in Essex. Well as it turns out it's going to be a far more complicated job returning her to her former glory than first thought. East Norfolk Bus Blog has published an extensive update on what has already been done and what needs to be done to the Ollie and you can read that by clicking here. Suffice it to say it looks like a good couple of years and many gold coins before she emerges reborn. Had to nip into Lowestoft today for retail purposes, and due to a multitude of Pontins campers swarming all over the 61, I went via a combination of 146 and 99, the 99 being Gemini 37564. Whilst en route to Lowie I spied from my front top deck vantage point am ALX400 coming the other way. I'm not sure what prompted me to squint hard as we passed but glad I did as it turned out to be Essex Volvo B7tl 30902. Except Essex no more. Vinyls have been removed and it would appear 30902 has replaced her written of sister 30889. This meant only one thing - hang around in the rain at Lowestoft for a couple of pictures. Not something I do by choice as a rule, except I did have a few moments with John D, which is always a pleasure - sorry I didn't recognise you sooner buddy! The rear shot clearly shows the Essex vinyls removed. Much more exciting, though, is the news reported by Steven Knight Media today, which reveals an imminent delivery of 9 E200MMC's for Coasthopper services operating out of Kings Lynn. The 10.5m vehicles, numbered 37431-39 will be painted in Coasthopper livery. The first of the batch is expected at Ely today for service preparation work before being moved to Kings Lynn. Seems I have a date at the coast booked in the near future! On the MMC theme the Scania E400MMC's in East Kent have started to hit the road, with the first 13 entering service on the "Breeze" services between Margate/Broadstairs and Canterbury. I'll be getting down there asap to sample them. It's interesting to note, however that in Stagecoach's 2016/17 new bus order not a single Scania chassis has been ordered. I'll endeavour to find out why. There are some who say drivers, particularly train drivers are overpaid. I do not subscribe to that theory. I remember when I was doing my conductor training being staggered just how many rules and procedures I had to learn. Many of these procedures I would never have to use but I had to know them. What to do if someone fell under the train, if I found a door open, where to lay detonators for line protection and exceptions to those rules, emergency coupling and uncoupling, procedures for getting current turned off etc etc. Even where braking points on a line were so I could apply the emergency break if required. For drivers you can quadruple that at least. The rule book is immense. The same applies to bus drivers. There are many things a driver has to have stored in his brain that can be retrieved in an instant. Oh and of course there's the main thing people forget. These guys and gals have our lives in their hands day in day out. Over the last couple of weeks this has been brought home in a number of incidences. The week before last a bus driver was making his way back to the depot after an early morning contract run. He was minding his own business, sticking to the speed limit when a van ploughs into him at 70mph. The front of the bus is destroyed but mercifully the bus driver was thrown clear and was not seriously injured. I recall riding in the front cab of a train with a driver mate of mine when he suddenly went into meltdown. A tractor was crossing the line what I thought was miles in front of us. However my mate said had the tractor stalled while crossing there is no way he could have stopped the train. Today, near Thetford a train traveling at speed with 135 people on board hit a tractor on an unmanned crossing. 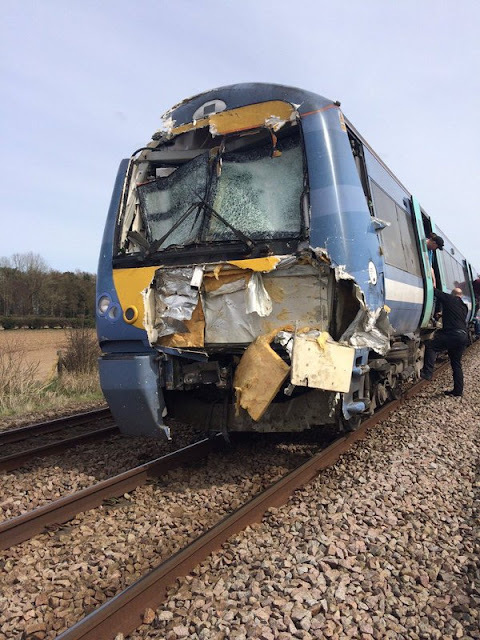 When you see the front of the train it is a miracle the driver was not seriously injured or worse. Last week I was traveling on a bus. A perfectly normal journey until the bus overtook a couple of cyclists. A mother with a baby on the back riding behind her son who looked about 8. Without any indication the boy suddenly veered across the road in front of the bus. It was one of those occasions time stood still. As fast as the bus swerved the boy seemed to come across even more. But in some of the best driving I have ever witnessed the driver managed to miss the boy and also avoided putting the bus head first into a tree. I have replayed the incident in my mind numerous times and still don't know how that lad didn't end up under the bus. As it happened no one was hurt, no damage to anything, a couple of very scared but relieved souls and a massive dose of respect to the driver who pulled out skills thankfully seldom needed in an instant. But it's not only humans who test the skills of our drivers, but Mother Nature does her best too. 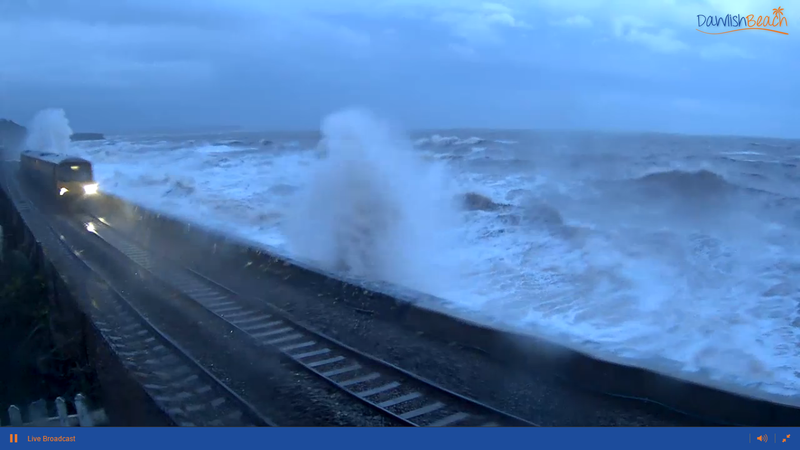 I've spent a lot of the day watching from the safety of my settee in awe as wave after wave smashed into the sea wall at Dawlish in the most spectacular style. I can only try to imagine what it must feel like to be in charge of a train seeing that heaving mass of water making a beeline for your head. Must need nerves of steel. 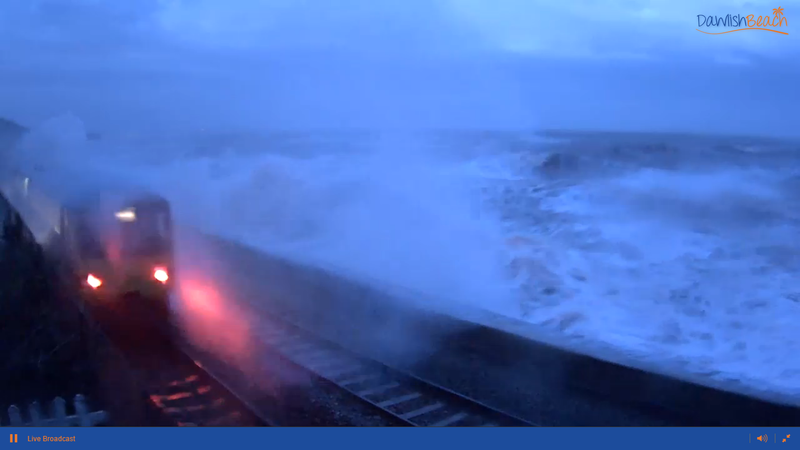 I took this screenshot from the outstanding Dawlish Beach San Remo cam earlier. I'm putting this one up purely because I love it and Twitter wouldn't upload it! Our drivers have to go to work not knowing if today is the day someone jumps in front of their train, or they're going to be sworn at, have a kid on a bike veer in front of them, have a passenger taken ill on their bus, or have to drive the train through 20ft waves. They are responsible for our safety constantly. On top of that we expect them to be friendly, accept having pictures taken with a toot or a wave, take everything in their stride and be unaffected by everything thrown at them. So give our drivers a break. I personally think they earn every penny they get, and in bus driver's case a whole lot more. To amend route, stopping places and timetable. The 1/1A will now run a faster route between Martham and Yarmouth, running via the main road omitting parts of Caistor which will be served by a re-routed 4. 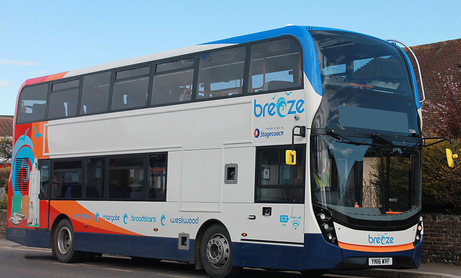 The 1B will operate during Summer months between Hemsby, Beach Rd, and Yarmouth, replacing the 3. . This service will now operate between Market Gates and Barrack Estate ONLY. The section of the route between Market Gates and JPH via Shrublands will be served by new Service 9. Frequencies of up to every 10 mins Mon - Sat and hourly Sundays. This Summer service is cancelled between Hemsby and Yarmouth, and replaced by a new route starting at Vauxhall Holiday Park and operating via Seashore Holiday Park and Yarmouth Rail Station. Timetable alterations but no alteration to route. To amend route, stopping places and timetable. The routing and frequency of the 6 is unchanged, the 6B is a peak journey which continues to Belton after serving Bradwell, but the big change is to the 7, which will now only operate evenings and Sundays. To amend route, stopping places and timetable. No longer serving Cliff Park to give faster journeys between JPH and Yarmouth. New service replacing the 2 between Market Gates and JPH via Cliff Park and Shrublands Estate. Service what?? Service X11 will replace the X1 shorts that terminate at JPH and will operate between Norwich - Yarmouth - Gorleston - JPH - Belton every half hour via the new link rd between Gorleston and Belton. This will give Belton a direct service to Norwich as well as a fast service to JPH. There are timetable changes to the X1 to link in with the X11. In Lowestoft there are timetable alterations to the X2, hopefully to avoid the convoy running with the X22, but most notably the 99 is going to extend one bus an hour from Kessingland to Southwold. Initially this is for Summers only, but subject to change depending on patronage. Many thanks to Chris Speed, who is overseeing these changes, for clarifying the above. Chris also informed me that the driver of the bus involved in that horrific accident on the A12 in Wrentham last week is doing fine and should be returning to work soon. However as has been reported in the press the van driver suffered serious life changing injuries. It appears the force of the collision was so vast the bus driver was somehow thrown out of the side window of his cab. 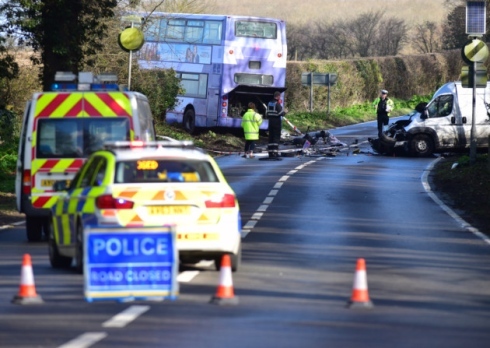 The bus involved, Volvo B7 ALX400 30889 is a total write off. I'm sure everyone joins me in wishing both drivers well in their respective recoveries. Finally speaking of patronage, I have just been informed that the new Charcoal Line route 40 between Poringland and Norwich has met its 6 week target in the first 3 DAYS of operation. I knew there was dissatisfaction with services in that area but my word that is some public response. Last April I spent a few chilly hours camped out at Kimberly Park station on the Mid Norfolk Railway observing going ons at the 2015 Diesel Gala. It was good but not quite Carling as the saying goes. However for the 2016 gala it wasn't just Carling but bordering on the Champagne! Undoubtedly the star attraction was 41001, the newly restored prototype HST, which is the only one of her type in the world. Apart from the bizarre front end the other endearing feature lies within, an original Paxman Valenta engine, whch is a Beethoven symphony to those of us who remember the original HST soundtrack before new engines were fitted. And speaking of soundtracks 3 Class 50's attending wasn't to be sneezed at either. I had aleady arranged to attend the event on the Saturday with good friend Tim Miller to ride the trains, but as the weather Friday was good I returned to Kimberly to do the photography in advance, far from the madding crowd. However, thanks to a camera malfunction I had to turn to videos, which turned out to be a good thing. There will be a zillion pics floating around of the event, but Kimberly Park is a superb place for videoing, as the locos have to slow down on the approach to the crossing before getting the green flag, which means that they are on full acceleration as they pass through the station. Tim and I returned there yesterday evening to catch the last trains through, the climax being 41001 at full revs without its usual Mark 3 coaches pulling a mix including Mark 1's and the 3 Class 50's on the rear. So sit back, relax, and enjoy the show. Turn the volume up to 11 - that's louder than 10! Thanks should go to Mid Norfolk Railway for organising this superb event, and all the dedicated nutters enthusiasts who spend hour after hour preserving these magnificent locos for our enjoyment. Highlight of the weekend for me was sitting right behind 50007 yesterday listening to that wonderful soundtrack, and seeing a stoat chase a rabbit at Kimberly on Friday - it's not just all about trains you know!! A plea to MNR for next year - how about Hastings Diesel 1001? PS If anyone has problems watching the vids let me know and I'll post the individual links. It was announced today that Mendlesham based Galloway has been sold to Eastern Transport Holdings Ltd, who also own Stephensons of Essex. The full press release reads as follows. The directors of Galloway Travel Group ("GTG") are delighted to announce that it is intended that Eastern Transport Holdings Limited ("ETH") will acquire the business operations of GTG on 30th November 2016. This announcement follows a period of close communication and discussion with the directors of ETH, whereby the retiring directors of GTG have been keen to ensure that the long term business plans of the new owners are aligned to the Galloway model. David Cattermole, Galloway M.D. said, "I and my fellow directors look forward to working with the ETH directors and management team in the future development of Galloway". GTG provide an extensive range of adult and school tours, coach hire and services on behalf of National Express, as well as local bus services within Suffolk. ETH shares common ownership with Stephensons of Essex Limited, a successful independent business providing local bus, school and rail replacement services across Essex and West Suffolk. The directors and Management Team of GTG will work closely with the directors of ETH to ensure that the new owners are able to develop an in depth knowledge and awareness of all aspects of the trading style of GTG before completion of their acquisition at the end of November 2016. With the delivery of this announcement, the directors of GTG intend to delegate day to day involvement in the business with immediate effect, handing over operational management to the existing Management Team of Richard Smith, Dan Rogers and Charles Pratt who have been working with the GTG directors over the last few years to support the intended retirement of the executive directors this year. ETH have confirmed that their acquisition of GTG represents a logical extension to the existing business, and is commensurate with their vision to diversify both their geographic footprint and range of income streams within the Eastern region. GTG will continue to trade as a standalone business, distinct from other subsidiary operations of ETH, and to operate from the existing Head Office located at Mendlesham. The existing Management Team of Galloway will be instrumental in assisting the directors of ETH in planning and developing an exciting future for Galloway over the coming years. I'm sure further details will emerge over the coming months, but on top of the sale of Carters and demise of Soames, the number of Suffolk independents is diminishing at an alarming rate. You may have seen in this space a report that a new Finance Director had been appointed to every Go-Ahead operator except Anglian. I am grateful to "J" for contacting me alerting me to the fact that Simon Butcher has indeed been appointed as Finance Director of Anglian too, but there was a delay in the publication from Companys House. Either that or someone stitched me up like a kipper on April 1st!! On its own this is insignificant but could be part of a bigger picture. A Konect driver told me today that the new uniform due soon does not have any Konect branding, simply the Go-Ahead logo. Could this be the beginning of the end to individual operator identity, and a movement towards a national identity? Time will tell. The weekend will be devoted to the outstanding Diesel Gala on the Mid Norfolk Railway, with some truly outstanding locos in use, including the world's only Class 41. I was at Kimberly today taking photos and videos and toomorrow with a couple of others I'll be riding the trains too. Then on Monday a special post courtesy of North Suffolk's newest anorak, who sent me a great selection of pictures from Dublin, including a very flash tour coach for a very popular band. Once upon a time, in a strange land far, far away there were two groups of people who thought it would be a good idea to provide a service to the good folk of the land. This involved some mechanical devices called buses. Buses, boys and girls are very big cars with many more seats, and the peasants who choose to use these buses have to pay the group of people providing the bus some money, known as a fare, unless they are very, very old people, or are unlucky people who can't drive. There was a place in this strange land, far, far away, where many people lived. One of the groups of people were providing buses to the area. However, many times these buses were either full or late, and the grown ups who lived in the area got very cross. The other group of people who provided buses took notice of this, and thought it would be a good idea to start providing their own buses, thinking the cross grown ups would start using their buses instead. And so messages were sent to the cross grown ups that there would be new, better, more reliable buses for them to use. Now, boys and girls, this made the people already providing the buses very angry indeed. "Why", they said, "we are better at providing buses than the others, and we will keep the peasants choosing our buses." Now in the past, children, there had been an easy way for the peasants to save money on their bus fares. They were able to pay for ten rides on the bus at a time, which was cheaper than buying them one at a time. But the people providing the buses got greedy and stopped the peasants from paying for ten rides at a time. This made the peasants very cross again. So the new providers of buses gave the peasants the chance to buy their rides ten at a time again as they were not as greedy and knew what would make the peasants happy. They set the fare at £17 for a grown up and £12 for a peasant not yet a grown up. This made the original providers even angrier. "How dare those new providers allow the peasants to pay for their rides ten at a time", they said. "We will bring back our tickets too, and the peasants will surely carry on using our buses" So sure were they that the peasants would be too scared to use the new buses that the original providers said they would charge £20 for a grown up, £16 for a nearly grown up, and £14 for a little boy or girl peasant. This despite their buses either being too full, late or going a longer way round. Now the clever grown ups, once they had stopped laughing, were not clever enough to work out why the original provider had decided to charge much more money than the new provider. "Surely", they said, "if a provider has made the peasants very cross, and their buses are either full, late, or go a long way round do they think making the peasants pay more money than the new buses will make them carry on choosing their bus over the new bus?" There is an old saying, children, that pride comes before a fall. This means that if you think you are better than anyone else, or that everyone you upset will forgive you and still want to be your friend, then you may end up very disappointed indeed. And the moral of this story? If you have already made your peasants very cross by giving them a poor service, you won't make them happy again by charging them lots more money than the new boys. If you believe that, then on this day you are bigger fools than any made up story could invent. Thank you for listening, boys and girls. It's time for a nap now. Goodbye.